The ultimate drag radial just got better! The Shinko Hook Up Pro Drag Radial rear tire features all the great features of the original Hook Up but now it is lighter,faster and even better at the top end of the track! Competition developed design allows for more horsepower top be used throughout the run due to a larger contact patch at high speed. A Enhanced carcuss resists distortion,chunking, and the stresses of centrifugal force to maintain amore constant footprint. The Shinko Drag Radial is recommended for drag racing use only and due to the soft compound of the tire it is NOT for use on dynometers! hooked!! on the hook up pro! Running shinko hook ups for 4 years trying this pro no first tire but man it seems more flexible then the hook up but on spencer cycles side I received my tire two days after order very impressed ! 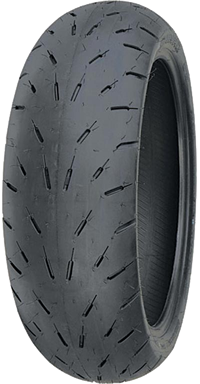 Click the button below to add the Shinko 003A Hook Up Pro Drag Radial Rear Motorcycle Tires to your bike build.